You can’t put a price on fun, but the Concordia Student Union is finding out the hard way that you can tax it. The Link has learned the CSU is in the process of paying $41,989.80 in back taxes not paid between 2011 and 2013 for non-Canadian entertainment artists and speakers, not including potential penalty fees. Under Regulation 105 of the Canadian Income Tax Regulations, all non-residents of Canada contracted for a service inside the country are required to have 15 per cent of their pay deducted as taxation. Similarly, there is a nine per cent tax on non-residents in Quebec. 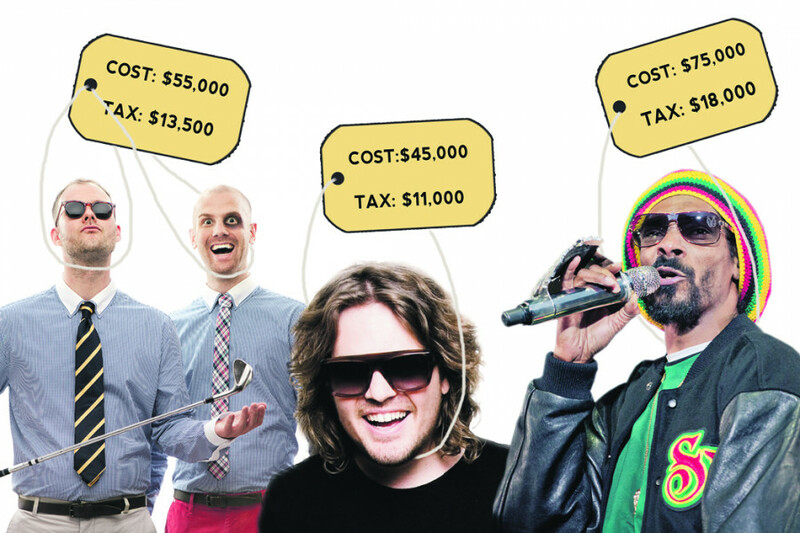 But CSU VP Finance Scott Carr says the CSU and its current members had no idea it was responsible for paying taxes on foreign artists until last September—after paying out $100,000 to have international electronic music artists DJ Tommy Trash and Dada Life headline the CSU’s fall Orientation. “We proceeded with business as usual all the way [through the summer] into Orientation and then it was immediately following Orientation that we were made aware of this predicament,” he said, corroborating the timeframe with internal emails between himself, CSU President Melissa Kate Wheeler and the union’s general manager, Robert Henri. The initial estimate was also a lot larger than $41,989.80, Carr added. Tax exemptions for not-for-profits enabled the union to drop the amount of unpaid taxes to a quarter of the original estimate, Carr said. However, despite the cost of the surprise taxes, this is not the first time the CSU has not paid its taxes on contracted foreign entertainment—and the last time it happened was only three years ago. The first time the CSU discovered it had not paid non-residents’ taxes was when the union was being audited by the Canada Revenue Agency in the fall of 2011, according to the voluntary disclosure agreement the union provided to the federal government Sept. 24 of last year. Then-CSU VP Finance Jordan Lindsay says the issue was originally brought to the attention of Michele Dumais, who served as CSU GM until the summer of 2012. No longer a part of the CSU, Lindsay was unable to provide an actual figure for the amount owed from 2008 to 2010. However, the 24 per cent in federal and provincial taxes for 2009 Orientation headliner Snoop Dogg—who cost a reported $75,000— would have totaled $18,000 alone. Lindsay’s estimate placed the total amount in the low $10,000s. Yet while the outstanding 2008-2010 taxes were paid by the 2011-2012 executive, non-resident taxes for events during their tenure were not paid, totaling over $1,500. “It was paid in 2012, but things from 2011 weren’t paid—so that’s weird, very weird,” admitted Carr. According to both Carr and Lindsay, the absence of a GM—who serves as the institutional memory of the union throughout the years and oversees day-to-day accounting—during the executive turnover in the summer semester of 2012 could have contributed to the non-resident tax not being properly communicated to the next crop of executives. “[Dumais] pulled away from all of her duties [at that time] and that wasn’t communicated at tax time,” said Lindsay. Dumais was unavailable for comment before press time. This was not the only miscommunication that occurred. Although Lindsay says he is “pretty sure” he informed his successor Keny Toto about the non-resident tax, Carr says nothing was communicated to him the following year when he took up the VP Finance portfolio. Toto was unable to provide comment before press time. “[This year’s executive] came in here to a mess,” said Carr. But upon Carr’s discovery of the current and previous rounds of unpaid taxes, he says he and Henri, who was hired as the CSU’s GM over the summer of 2013, realized the real extent of the financial muck. “Our goal, myself and [Henri], was: there’s a problem, we want to fix this problem first and foremost,” Carr said. Carr says another reason the CSU only discovered the current round of tax troubles in September of last year was because the union’s auditor, Deloitte Canada, had begun using an international accounting standard which clearly listed government remittances, which was not the case in the 2012 audit. Voluntary disclosure agreements were then prepared to acknowledge to the government the taxes were “to the best of the CSU’s knowledge” unknown to the union and therefore not paid. No non-resident taxes have gone unpaid since Orientation, including on such high-profile guests as world-renowned linguist Noam Chomsky and actor Gael García Bernal. The CSU brought Chomsky and Bernal in as part of its speaker series. Council was notified of the tax troubles at the September CSU meeting in closed session. According to Carr and Wheeler, this was done to ensure nothing jeopardized the union’s initial disclosure to the government of not paying its taxes. The tax issue originally came to the attention of The Link in January once it was discovered the fall Orientation had gone over its budget. However, sources were unable to speak on the record while the federal and provincial governments were rendering their decisions during the voluntary disclosure process. Despite voluntarily disclosing their mistake to the government, the union is potentially facing penalties on the federal taxes it owes. The penalty would amount to 15 per cent of the $26,243.63 in federal taxes owed, or roughly $4,000. “That’s a chunk of change; it’s students’ money that you’re paying because we didn’t pay our taxes right in the first place,” said Carr. “But the important thing to note was a precedent was created,” he continued. A spokesperson for the Canada Revenue Agency was unable to confirm or deny such a precedent. The union is currently undergoing negotiations to determine if it will be required to pay the $4,000 penalty. Regardless of whether the penalty is incurred, Wheeler says her executive is going to ensure the tax issues from their predecessors are not replicated by their successors. “This is an unfortunate example of what can happen when communication between years is very poor, and my executive is already working on the training program for our successors,” she said. Carr added he and other members of the CSU are in the process of tightening up financial controls and rendering them more transparent so there won’t be a third instance of unknowingly withheld taxes. One round of financial overhaul spearheaded by councillor Chuck Wilson—dealing with oversight on executive spending in the wake of a student-funded end-of-year party taking place last year—was already approved by council at a special council meeting in February. More changes are in the works, according to Carr. “Hopefully we can learn from this as an institution and make sure this kind of oversight never happens again,” she said.